Ahmed Musa’s brace gave Nigeria a vital 2-0 World Cup win over Iceland in Volgograd, handing Lionel Messi and Argentina a lifeline as a three-way battle for qualification behind Croatia in Group D goes to the wire. Musa opened the scoring just after half-time with a stunning half-volley, before embarking on a blistering run down the flank and then cutting inside and slotting into the net to double the Super Eagles’ lead on 75 minutes. The victory means Nigeria move into second in Group D on three points from their two games – two behind Croatia on six but two ahead of Iceland and Argentina, who are on one point apiece. An Iceland win would have spelled near-doom for two-time World Cup winners Argentina and Lionel Messi, but Musa’s heroics have blown things wide open for the group finale on Tuesday. After the game, Musa was hailed for handing his team a win and Argentina a lifeline – and was feted for doing more for the Argentinian World Cup cause than the misfiring Messi. 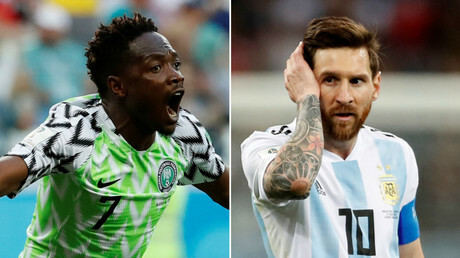 You know it’s a crazy World Cup when Ahmed Musa is contributing more to Argentina than Messi managed to. Ahhh good times. Others said that Musa had actually served Messi’s World Cup cause more than his Argentinian teammates. As the debate has raged over what Lionel Messi’s poor performances in Russia mean for his status as arguably the greatest ever to play the game, some suggested two-goal hero Musa – who now has four World Cup goals to his name in total after bagging two in Brazil four years ago – was a new candidate for the GOAT honors. Some picked up on the fact that Musa had notched a double against an Icelandic defence that Messi had failed to breach in Argentina’s group game – when he missed a penalty – and Cristiano Ronaldo hadn’t managed in Portugal and Iceland’s Euro 2016 encounter. Musa out here doing what Ronaldo and Messi couldn't do against Iceland. SCORE. My new GOAT. Put some respect on his name. Russia certainly seems to bring the best out of Musa, who has played much of his club football for CSKA Moscow. He moved to English Premier League team Leicester City two years ago after a prolific spell in the Russian capital, but failed to settle and spent much of last season on loan back at CSKA. Group D is now set for a blockbuster finale on Tuesday when Iceland take on already-qualified Croatia in Rostov and Nigeria face Argentina in St. Petersburg.